John Dunbar was a teacher and school principal. In the Vancouver directory for 1920, he was living at 1813 Morton Avenue. John Dunbar was born in Mornington, Perth County, Ontario, on January 21, 1872. His father was James Dunbar (1842-1917), who was a farmer. John’s mother was Catherine Millar (1844-1905). John became a school teacher. On December 28, 1898, in Logan, Ontario, John married Mary Martha Thompson. She was born in Logan on March 24, 1874. Her father was John Robert Thompson (1842-1920), who was a farmer. Mary’s mother was Jane Linton (1850-1938). John worked as a teacher in Ontario until about 1912. He first appeared in the Vancouver directories in 1913. The Dunbar family lived at the following addresses in Vancouver. John continued to work as a teacher and school principal until he retired about 1939. John and Mary lived in Vancouver through the 1950s. John died in Vancouver on September 26, 1960. He was buried in Mountain View Cemetery in Vancouver. Mary died in Vancouver on December 29, 1969. She was buried in Mountain View Cemetery in Vancouver. John and Mary had the following children. Violet Evelyn Dunbar was born in Downie, Ontario, on September 29, 1899. She was an accomplished academic. She received a B.A. in 1921 and an M.A. in 1922. She taught briefly at Lord Hudson School in 1923, and then went to the University of Toronto, where she studied biochemistry. She received a Ph.D. in 1929. On June 25, 1930, in Vancouver, Evelyn married Blythe Alfred Eagles. He was born in New Westminster, British Columbia, on April 23, 1902. His father was John (“Jack”) Edmund Eagles. His mother was Amelia Jane Johnston. Blythe also had an impressive academic career. After winning the gold medal at the University of British Columbia in 1922, he went to the University of Toronto, where he received an M.A. in 1924 and a Ph.D. in 1926. He returned to the University of British Columbia, where he was the head of the Department of Dairying from 1936 to 1955. From 1955 to 1967, he was the chairman of the Division of Animal Science. As well, he was the dean of the Faculty of Agriculture from 1949 until he retired in 1967. Violet and Blythe were well-known community volunteers in Burnaby. They had a home and beautiful garden at Deer Lake. Blythe died in Burnaby on July 11, 1990. He was buried in Fraser Cemetery in New Westminster, British Columbia. Violet died in Burnaby on July 2, 1993. She was buried in Fraser Cemetery in New Westminster. Blythe and Violet did not have any children. Lorne Hanon Dunbar was born in Logan, Ontario, on August 12, 1901. In 1921, he was studying electrical engineering. By 1925, he was a driver for the building supply firm of McCleery and Weston. On October 1, 1925, in Vancouver, Lorne married Jessie McGregor Johnstone. She was born in Edinburgh, Scotland, about 1902. Her father was John Johnstone. Her mother was Isabel Anderson. This marriage ended in divorce. By 1931, Lorne was a concrete mixer with Louis M. Diether’s building supply company. On January 17, 1931, in Vancouver, Lorne married Alice Irene Morris. She was born on May 8, 1906, in England (possibly in Aston, Warwickshire). Her father was William Morris. Her mother was Martha Hill. In 1969, Lorne was living in Santa Monica, California. Alice died in Sechelt, British Columbia, on September 1, 1987. Lorne died in Sechelt on January 9, 1988. Lorne and Alice had a son, Raymond Lorne Dunbar, who was born in Vancouver on January 23, 1936. He married Elaine Nancy Kinkead. Raymond worked as a survey and forecasting clerk for the British Columbia Telephone Company. His work sometimes required him to travel to other parts of the province. In June 1970 he was on an airplane that went missing. 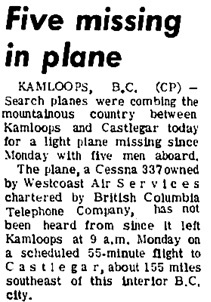 The coroner later confirmed that the airplane had crashed near Cherryville, British Columbia. Raymond was killed in the crash, along with the pilot and three other men. 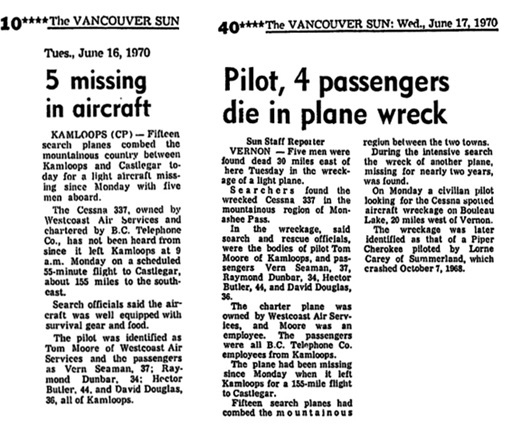 “5 Missing in aircraft,” Vancouver Sun, June 16, 1970, page 10; “Pilot, 4 passengers die in plane wreck,” Vancouver Sun, June 17, 1970, page 40; reproduced in “Find A Grave Index,” database, FamilySearch (https://familysearch.org/ark:/61903/1:1:QVG5-BB5C : 13 December 2015), Thomas Edward Moore, 1970; Burial, Kamloops, Thompson-Nicola Regional District, British Columbia, Canada, Hillside Cemetery; citing record ID 133327470, Find a Grave, http://www.findagrave.com/cgi-bin/fg.cgi?page=gr&GRid=133327470. “Ontario Census, 1861,” database, FamilySearch (https://familysearch.org/ark:/61903/1:1:MQ7L-13M : 8 November 2014), James Dunbar, Mornington, Perth, Ontario, Canada; citing p. 33, line 40; Library and Archives Canada film number C-1065, Public Archives, Toronto; FHL microfilm 2,435,938; http://data2.collectionscanada.gc.ca/1861/pdf/4391567_00314.pdf. “Canada Census, 1871,” database, FamilySearch (https://familysearch.org/ark:/61903/1:1:M43P-32T : 13 November 2014), James Dunbar, Mornington, North Perth, Ontario, Canada; citing p. 20, line 7; Library and Archives Canada film number C-9941, Public Archives, Ottawa, Ontario; FHL microfilm 4,396,296; http://data2.collectionscanada.ca/1871/pdf/4396296_00558.pdf. “Canada Census, 1881,” database, FamilySearch (https://familysearch.org/ark:/61903/1:1:MVF1-QLP : 18 November 2014), James Dunbar, Mornington, Perth North, Ontario, Canada; citing p. 26; Library and Archives Canada film number C-13272, Library and Archives Canada, Ottawa, Ontario; FHL microfilm 1,375,908; http://data2.collectionscanada.gc.ca/e/e329/e008202215.pdf. “Canada Census, 1891,” database, FamilySearch (https://familysearch.org/ark:/61903/1:1:MWGM-L4P : 13 November 2014), James Dunbar, Mornington, Perth North, Ontario, Canada; Public Archives, Ottawa, Ontario; Library and Archives Canada film number 30953_148164; http://central.bac-lac.gc.ca/.item/?app=Census1891&op=pdf&id=30953_148164-00343. “Canada Census, 1901,” database, FamilySearch (https://familysearch.org/ark:/61903/1:1:KHGS-5TD : 13 November 2014), James Dunbar, F, Perth (north/nord), Ontario, Canada; citing p. 6, Library and Archives of Canada, Ottawa; http://automatedgenealogy.com/census/View.jsp?id=100293&highlight=30&desc=1901+Census+of+Canada+page+containing+James+Dunbar; http://data2.collectionscanada.ca/1901/z/z002/pdf/z000094532.pdf. “Recensement du Canada de 1911,” database, FamilySearch (https://familysearch.org/ark:/61903/1:1:276V-MT4 : 2 March 2015), James Dumbar in entry for Millar W Dunbar, 1911; citing Census, Perth North Sub-Districts 1-57, Ontario, Canada, Library and Archives of Canada, Ottawa, Ontario; FHL microfilm 2,418,517; http://automatedgenealogy.com/census11/View.jsp?id=53891&highlight=1&desc=1911+Census+of+Canada+page+containing+James+Dunbar; http://data2.collectionscanada.gc.ca/1911/pdf/e002012775.pdf [indexed as James Dunton]. “Ontario Deaths, 1869-1937 and Overseas Deaths, 1939-1947,” database with images, FamilySearch (https://familysearch.org/ark:/61903/1:1:JKWS-QVN : 11 December 2014), James Dunbar, 30 Nov 1917; citing Mornington, Perth, Ontario, 025293, Archives of Ontario, Toronto; FHL microfilm 1,862,687. “Canada Census, 1871,” database, FamilySearch (https://familysearch.org/ark:/61903/1:1:M43P-32Y : 13 November 2014), Catherine Dunbar in household of James Dunbar, Mornington, North Perth, Ontario, Canada; citing p. 20, line 8; Library and Archives Canada film number C-9941, Public Archives, Ottawa, Ontario; FHL microfilm 4,396,296; http://data2.collectionscanada.ca/1871/pdf/4396296_00558.pdf. “Canada Census, 1881,” database, FamilySearch (https://familysearch.org/ark:/61903/1:1:MVF1-QL5 : 18 November 2014), Catharine Dunbar in household of James Dunbar, Mornington, Perth North, Ontario, Canada; citing p. 26; Library and Archives Canada film number C-13272, Library and Archives Canada, Ottawa, Ontario; FHL microfilm 1,375,908; http://data2.collectionscanada.gc.ca/e/e329/e008202215.pdf. “Canada Census, 1891,” database, FamilySearch (https://familysearch.org/ark:/61903/1:1:MWGM-L45 : 13 November 2014), Catherine Dunbar, Mornington, Perth North, Ontario, Canada; Public Archives, Ottawa, Ontario; Library and Archives Canada film number 30953_148164; http://central.bac-lac.gc.ca/.item/?app=Census1891&op=pdf&id=30953_148164-00343. “Canada Census, 1901,” database, FamilySearch (https://familysearch.org/ark:/61903/1:1:KHGS-5T6 : 13 November 2014), Catherine Dunbar in household of James Dunbar, F, Perth (north/nord), Ontario, Canada; citing p. 6, Library and Archives of Canada, Ottawa; http://automatedgenealogy.com/census/View.jsp?id=100293&highlight=31&desc=1901+Census+of+Canada+page+containing+Catherine+Dunbar; http://data2.collectionscanada.ca/1901/z/z002/pdf/z000094532.pdf. “Ontario Deaths, 1869-1937 and Overseas Deaths, 1939-1947,” database with images, FamilySearch (https://familysearch.org/ark:/61903/1:1:JXKK-HPR : 24 June 2015), Catharine Dunbar, 28 Mar 1905; citing Mornington, Perth, Ontario, yr 1905 cn 22904, Archives of Ontario, Toronto; FHL microfilm 1,854,397. “Ontario Births, 1869-1911,” database with images, FamilySearch (https://familysearch.org/ark:/61903/1:1:FM3N-661 : 15 January 2016), John Dunbar, 21 Jan 1872; citing Birth, Mornington, Perth, Ontario, Canada, citing Archives of Ontario, Toronto; FHL microfilm 1,844,890. “Canada Census, 1881,” database, FamilySearch (https://familysearch.org/ark:/61903/1:1:MVF1-QLR : 18 November 2014), John Dunbar in household of James Dunbar, Mornington, Perth North, Ontario, Canada; citing p. 26; Library and Archives Canada film number C-13272, Library and Archives Canada, Ottawa, Ontario; FHL microfilm 1,375,908; http://data2.collectionscanada.gc.ca/e/e329/e008202215.pdf. “Canada Census, 1891,” database, FamilySearch (https://familysearch.org/ark:/61903/1:1:MWGM-L4R : 13 November 2014), John Dunbar, Mornington, Perth North, Ontario, Canada; Public Archives, Ottawa, Ontario; Library and Archives Canada film number 30953_148164; http://central.bac-lac.gc.ca/.item/?app=Census1891&op=pdf&id=30953_148164-00343. “Ontario Marriages, 1869-1927,” database with images, FamilySearch (https://familysearch.org/ark:/61903/1:1:KZBQ-3KR : 10 April 2015), John B Dunbar and Mary Martha Thompson, 28 Dec 1898; citing registration , Logan, Perth, Ontario, Canada, Archives of Ontario, Toronto; FHL microfilm 1,870,921. “Canada Census, 1901,” database, FamilySearch (https://familysearch.org/ark:/61903/1:1:KHGD-SD9 : 13 November 2014), John Dunbar, D, Simcoe (north/nord), Ontario, Canada; citing p. 10, Library and Archives of Canada, Ottawa; http://automatedgenealogy.com/census/View.jsp?id=103745&highlight=28&desc=1901+Census+of+Canada+page+containing+John+Dunbar; http://data2.collectionscanada.ca/1901/z/z003/pdf/z000102822.pdf. “Recensement du Canada de 1911,” database, FamilySearch (https://familysearch.org/ark:/61903/1:1:QV9T-T83G : 2 March 2015), John Dunbar, 1911; citing Census, London Sub-Districts 1-34, Ontario, Canada, Library and Archives of Canada, Ottawa, Ontario; FHL microfilm 2,418,508; http://automatedgenealogy.com/census11/View.jsp?id=152733&highlight=48&desc=1911+Census+of+Canada+page+containing+John+Dunbar; http://data2.collectionscanada.gc.ca/1911/pdf/e002001781.pdf. 1921 Canada Census; John Dunbar; Reference Number: RG 31; Folder Number: 12; Census Place: Ward 5, Vancouver, British Columbia; Page Number: 3; Ancestry.com. 1921 Census of Canada [database on-line]. Provo, UT, USA: Ancestry.com Operations Inc, 2013. “British Columbia Death Registrations, 1872-1986; 1992-1993”, database with images, FamilySearch (https://familysearch.org/ark:/61903/1:1:FLTM-49P : 30 September 2015), John Dunbar, 1960. “Ontario Marriages, 1869-1927,” database with images, FamilySearch (https://familysearch.org/ark:/61903/1:1:FMNH-M69 : 10 April 2015), John Robert Thompson and Jane Linton, 27 Feb 1873; citing registration , Fullerton, Perth, Ontario, Canada, Archives of Ontario, Toronto; FHL microfilm 1,862,890. “Canada Census, 1881,” database, FamilySearch (https://familysearch.org/ark:/61903/1:1:MVFB-45L : 18 November 2014), John Thompson, Logan, Perth North, Ontario, Canada; citing p. 44; Library and Archives Canada film number C-13271, Library and Archives Canada, Ottawa, Ontario; FHL microfilm 1,375,907. “British Columbia Death Registrations, 1872-1986; 1992-1993”, database with images, FamilySearch (https://familysearch.org/ark:/61903/1:1:FLKF-1XP : 30 September 2015), John Robert Thompson, 1920. “Ontario Marriages, 1869-1927,” database with images, FamilySearch (https://familysearch.org/ark:/61903/1:1:FMNH-M6Q : 10 April 2015), John Robert Thompson and Jane Linton, 27 Feb 1873; citing registration , Fullerton, Perth, Ontario, Canada, Archives of Ontario, Toronto; FHL microfilm 1,862,890. “Canada Census, 1881,” database, FamilySearch (https://familysearch.org/ark:/61903/1:1:MVFB-45G : 18 November 2014), Jane Thompson in household of John Thompson, Logan, Perth North, Ontario, Canada; citing p. 44; Library and Archives Canada film number C-13271, Library and Archives Canada, Ottawa, Ontario; FHL microfilm 1,375,907. “British Columbia Death Registrations, 1872-1986; 1992-1993”, database with images, FamilySearch (https://familysearch.org/ark:/61903/1:1:FL22-RS3 : 30 September 2015), Jane Thompson, 1938. “Ontario Births, 1869-1911,” database with images, FamilySearch (https://familysearch.org/ark:/61903/1:1:VNLK-KFH : 15 January 2016), Mary Martha Thompson, 24 Mar 1874; citing Birth, Logan, Perth, Ontario, Canada, citing Archives of Ontario, Toronto; FHL microfilm 1,845,044. “Ontario Births and Baptisms, 1779-1899,” database, FamilySearch (https://familysearch.org/ark:/61903/1:1:XLBD-F9R : 5 December 2014), Mary Martha Thompson, 24 Mar 1874; citing Logan, Perth, Ontario; FHL microfilm 1,845,044. “Canada Births and Baptisms, 1661-1959,” database, FamilySearch (https://familysearch.org/ark:/61903/1:1:FLF5-SSZ : 27 November 2014), Mary Martha Thompson, 24 Mar 1874; citing Logan, Perth, Ontario, 24 Mar 1874, reference 262; FHL microfilm 1,845,044. “Canada Census, 1881,” database, FamilySearch (https://familysearch.org/ark:/61903/1:1:MVFB-45P : 18 November 2014), Mary M. Thompson in household of John Thompson, Logan, Perth North, Ontario, Canada; citing p. 44; Library and Archives Canada film number C-13271, Library and Archives Canada, Ottawa, Ontario; FHL microfilm 1,375,907; http://data2.collectionscanada.gc.ca/e/e329/e008201686.pdf. “Canada Census, 1891,” database, FamilySearch (https://familysearch.org/ark:/61903/1:1:MWGM-FN5 : 13 November 2014), Mary M Thompson, Logan, Perth North, Ontario, Canada; Public Archives, Ottawa, Ontario; Library and Archives Canada film number 30953_148164; http://central.bac-lac.gc.ca/.item/?app=Census1891&op=pdf&id=30953_148164-00236. 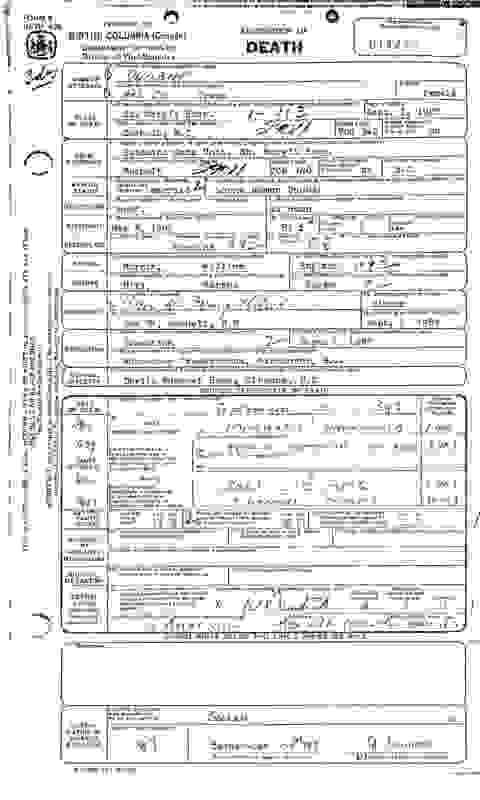 “Ontario Marriages, 1869-1927,” database with images, FamilySearch (https://familysearch.org/ark:/61903/1:1:KZBQ-3KB : 10 April 2015), John B Dunbar and Mary Martha Thompson, 28 Dec 1898; citing registration , Logan, Perth, Ontario, Canada, Archives of Ontario, Toronto; FHL microfilm 1,870,921. “Canada Census, 1901,” database, FamilySearch (https://familysearch.org/ark:/61903/1:1:KHGD-SDS : 13 November 2014), Mary M Dunbar in household of John Dunbar, D, Simcoe (north/nord), Ontario, Canada; citing p. 10, Library and Archives of Canada, Ottawa; http://automatedgenealogy.com/census/View.jsp?id=103745&highlight=29&desc=1901+Census+of+Canada+page+containing+Mary+M+Dunbar; http://data2.collectionscanada.ca/1901/z/z003/pdf/z000102822.pdf. “Recensement du Canada de 1911,” database, FamilySearch (https://familysearch.org/ark:/61903/1:1:QV9T-T83P : 2 March 2015), Mary Dunbar in entry for John Dunbar, 1911; citing Census, London Sub-Districts 1-34, Ontario, Canada, Library and Archives of Canada, Ottawa, Ontario; FHL microfilm 2,418,508; http://automatedgenealogy.com/census11/View.jsp?id=152733&highlight=49&desc=1911+Census+of+Canada+page+containing+Mary+Dunbar; http://data2.collectionscanada.gc.ca/1911/pdf/e002001781.pdf. 1921 Canada Census; Mary Dunbar in household of John Dunbar, Reference Number: RG 31; Folder Number: 12; Census Place: Ward 5, Vancouver, British Columbia; Page Number: 3; Ancestry.com. 1921 Census of Canada [database on-line]. Provo, UT, USA: Ancestry.com Operations Inc, 2013. “British Columbia Death Registrations, 1872-1986; 1992-1993”, database with images, FamilySearch (https://familysearch.org/ark:/61903/1:1:FLYZ-HJP : 30 September 2015), Mary Martha Dunbar, 1969. “British Columbia Death Registrations, 1872-1986; 1992-1993”, database with images, FamilySearch (https://familysearch.org/ark:/61903/1:1:FLR5-67L : 30 September 2015), Edgar Linton Thompson, 1955. “Ontario Births, 1869-1911,” database with images, FamilySearch (https://familysearch.org/ark:/61903/1:1:FM36-FRJ : 15 January 2016), Violet Evelyn Dunbar, 29 Sep 1899; citing Birth, Downie, Perth, Ontario, Canada, citing Archives of Ontario, Toronto; FHL microfilm 2,022,193. “Canada Census, 1901,” database, FamilySearch (https://familysearch.org/ark:/61903/1:1:KHGD-SD3 : 13 November 2014), Violet E Dunbar in household of John Dunbar, D, Simcoe (north/nord), Ontario, Canada; citing p. 10, Library and Archives of Canada, Ottawa; http://automatedgenealogy.com/census/View.jsp?id=103745&highlight=30&desc=1901+Census+of+Canada+page+containing+Violet+E+Dunbar; http://data2.collectionscanada.ca/1901/z/z003/pdf/z000102822.pdf. “Recensement du Canada de 1911,” database, FamilySearch (https://familysearch.org/ark:/61903/1:1:QV9T-T835 : 2 March 2015), Violet W Dunbar in entry for John Dunbar, 1911; citing Census, London Sub-Districts 1-34, Ontario, Canada, Library and Archives of Canada, Ottawa, Ontario; FHL microfilm 2,418,508; http://automatedgenealogy.com/census11/View.jsp?id=152733&highlight=50&desc=1911+Census+of+Canada+page+containing+Violet+W.+Dunbar; http://data2.collectionscanada.gc.ca/1911/pdf/e002001781.pdf. 1921 Canada Census; Violet Dunbar in household of John Dunbar, Reference Number: RG 31; Folder Number: 12; Census Place: Ward 5, Vancouver, British Columbia; Page Number: 3; Ancestry.com. 1921 Census of Canada [database on-line]. Provo, UT, USA: Ancestry.com Operations Inc, 2013. “British Columbia Marriage Registrations, 1859-1932; 1937-1938,” database with images, FamilySearch (https://familysearch.org/ark:/61903/1:1:JDD4-3QJ : 21 January 2016), Blythe Alfred Eagles and Violet Evelyn Dunbar, 25 Jun 1930; citing Vancouver, British Columbia, Canada, British Columbia Archives film number B13759, Vital Statistics Agency, Victoria; FHL microfilm 2,074,555. “British Columbia Death Registrations, 1872-1986; 1992-1993”, database with images, FamilySearch (https://familysearch.org/ark:/61903/1:1:QK6P-PT3Z : 5 October 2015), Violet Evelyn Eagles, 1993. “Find A Grave Index,” database, FamilySearch (https://familysearch.org/ark:/61903/1:1:QK18-SYW8 : 15 December 2015), Violet Evelyn Eagles, 1993; Burial, New Westminster, Greater Vancouver Regional District, British Columbia, Canada, Fraser Cemetery; citing record ID 141905172, Find a Grave, http://www.findagrave.com/cgi-bin/fg.cgi?page=gr&GRid=141905172. British Columbia Birth Registrations; Registration Number: 1902-09-496349; Blythe Alfred Eagles; date of birth: April 23, 1902; place of birth: New Westminster; http://search-collections.royalbcmuseum.bc.ca/genealogy-images/004401556/004401556_00130.jpg. “Recensement du Canada de 1911,” database, FamilySearch (https://familysearch.org/ark:/61903/1:1:QV9P-BP99 : 2 March 2015), Blythe Eagles in entry for John Eagles, 1911; citing Census, New Westminster Sub-Districts 1-20, British Columbia, Canada, Library and Archives of Canada, Ottawa, Ontario; FHL microfilm 2,417,660. “Vermont, St. Albans Canadian Border Crossings, 1895-1954,” database with images, FamilySearch (https://familysearch.org/ark:/61903/1:1:QK3T-QQVP : 9 October 2015), Blythe Eagles, 1924-1952; citing M1463, Soundex Index to Canadian Border Entries through the St. Albans, Vermont, District, 1895-1924, 27, NARA microfilm publications M1461, M1463, M1464, and M1465 (Washington D.C.: National Archives and Records Administration, publication year); FHL microfilm 1,570,740. “New York, Northern Arrival Manifests, 1902-1956,” database with images, FamilySearch (https://familysearch.org/ark:/61903/1:1:Q23H-KWK7 : 20 May 2016), Blythe Eagles, 1926; citing NARA microfilm publication M1480 and M1482 (Washington D.C.: National Archives and Records Administration, n.d.); roll 00036, FHL microfilm 1,283,676. “British Columbia Marriage Registrations, 1859-1932; 1937-1938,” database with images, FamilySearch (https://familysearch.org/ark:/61903/1:1:JDD4-3Q2 : 21 January 2016), Blythe Alfred Eagles and Violet Evelyn Dunbar, 25 Jun 1930; citing Vancouver, British Columbia, Canada, British Columbia Archives film number B13759, Vital Statistics Agency, Victoria; FHL microfilm 2,074,555. British Columbia Death Registrations; Registration Number: 1990-09-013093; Blythe Alfred Eagles; date of death: July 11, 1990; place of death: Burnaby; age at death: 88; http://search-collections.royalbcmuseum.bc.ca/genealogy-images/Phase2/DTH/DTH_1990013093.jpg; medical certificate of death: http://search-collections.royalbcmuseum.bc.ca/genealogy-images/Phase2/DTH/DTH_1990013093M.jpg. “Find A Grave Index,” database, FamilySearch (https://familysearch.org/ark:/61903/1:1:QK18-STR5 : 15 December 2015), Blythe Alfred Eagles, 1990; Burial, New Westminster, Greater Vancouver Regional District, British Columbia, Canada, Fraser Cemetery; citing record ID 141905468, Find a Grave, http://www.findagrave.com/cgi-bin/fg.cgi?page=gr&GRid=141905468. 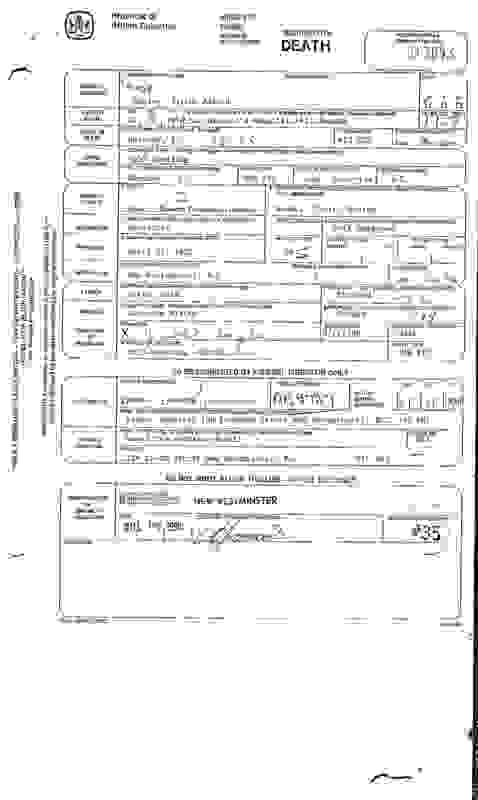 “Ontario Births, 1869-1911,” database with images, FamilySearch (https://familysearch.org/ark:/61903/1:1:FM47-Z4W : 15 January 2016), Lorne Hanom Dunbar, 12 Aug 1901; citing Birth, Logan Township, Perth, Ontario, Canada, citing Archives of Ontario, Toronto; FHL microfilm 2,079,526. “Recensement du Canada de 1911,” database, FamilySearch (https://familysearch.org/ark:/61903/1:1:QV9T-T83R : 2 March 2015), Lorne H Dunbar in entry for John Dunbar, 1911; citing Census, London Sub-Districts 1-34, Ontario, Canada, Library and Archives of Canada, Ottawa, Ontario; FHL microfilm 2,418,508. 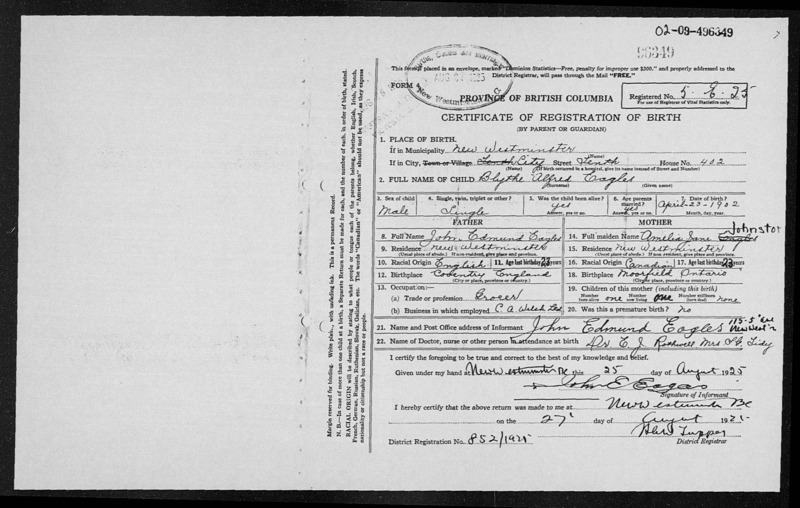 1921 Canada Census; Lorne Dunbar in household of John Dunbar, Reference Number: RG 31; Folder Number: 12; Census Place: Ward 5, Vancouver, British Columbia; Page Number: 3; Ancestry.com. 1921 Census of Canada [database on-line]. Provo, UT, USA: Ancestry.com Operations Inc, 2013. “British Columbia Marriage Registrations, 1859-1932; 1937-1938,” database with images, FamilySearch (https://familysearch.org/ark:/61903/1:1:JD85-BHJ : 21 January 2016), Lorne Hanon Dunbar and Jessie Mcgregor Johnstone, 01 Oct 1925; citing Vancouver, British Columbia, Canada, British Columbia Archives film number B13749, Vital Statistics Agency, Victoria; FHL microfilm 2,074,319. “British Columbia Marriage Registrations, 1859-1932; 1937-1938,” database with images, FamilySearch (https://familysearch.org/ark:/61903/1:1:JDDS-VXX : 21 January 2016), Lorne Hanon Dunbar and Alice Irene Morris, 17 Jan 1931; citing Vancouver, British Columbia, Canada, British Columbia Archives film number B13761, Vital Statistics Agency, Victoria; FHL microfilm 2,074,557. 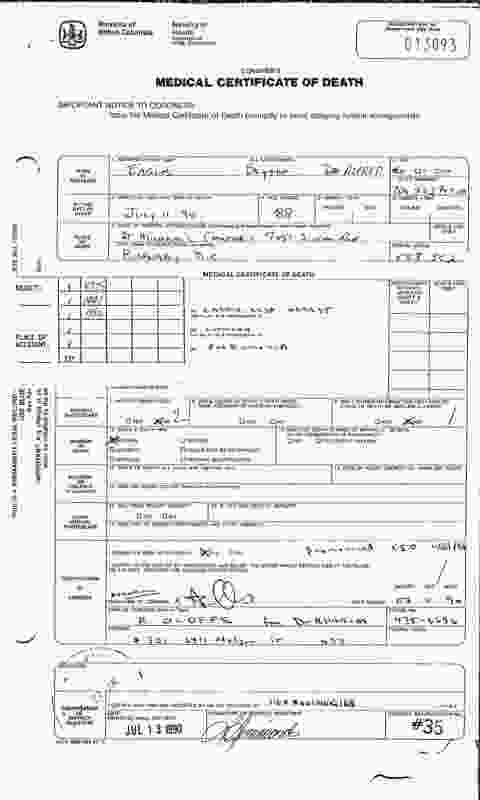 “United States Social Security Death Index,” database, FamilySearch (https://familysearch.org/ark:/61903/1:1:JB3N-MQS : 20 May 2014), Lorne H Dunbar, 09 Jan 1988; citing U.S. Social Security Administration, Death Master File, database (Alexandria, Virginia: National Technical Information Service, ongoing). British Columbia Death Registrations: Registration Number: 1987-09-014422; Alice Irene Dunbar; date of death: September 1, 1987-09-01; place of death: Sechelt; age: 81; http://search-collections.royalbcmuseum.bc.ca/genealogy-images/Phase2/DTH/DTH_1987014422.jpg. “British Columbia Death Registrations, 1872-1986; 1992-1993”, database with images, FamilySearch (https://familysearch.org/ark:/61903/1:1:FLYN-ZR5 : 30 September 2015), Raymond Lorne Dunbar, 1970. “British Columbia Death Registrations, 1872-1986; 1992-1993”, database with images, FamilySearch (https://familysearch.org/ark:/61903/1:1:FLYN-8L5 : 30 September 2015), Vernon David Seaman, 1970. “Find A Grave Index,” database, FamilySearch (https://familysearch.org/ark:/61903/1:1:QVGM-D36G : 13 December 2015), Vernon David Seaman, 1970; Burial, Trail, Kootenay Boundary Regional District, British Columbia, Canada, Mountain View Cemetery; citing record ID 110636514, Find a Grave, http://www.findagrave.com/cgi-bin/fg.cgi?page=gr&GRid=110636514. “British Columbia Death Registrations, 1872-1986; 1992-1993”, database with images, FamilySearch (https://familysearch.org/ark:/61903/1:1:FLYN-ZR2 : 30 September 2015), David Bernard Douglas, 1970. “British Columbia Death Registrations, 1872-1986; 1992-1993”, database with images, FamilySearch (https://familysearch.org/ark:/61903/1:1:FLYN-824 : 30 September 2015), Thomas Edward Moore, 1970. “Find A Grave Index,” database, FamilySearch (https://familysearch.org/ark:/61903/1:1:QVG5-BB5C : 13 December 2015), Thomas Edward Moore, 1970; Burial, Kamloops, Thompson-Nicola Regional District, British Columbia, Canada, Hillside Cemetery; citing record ID 133327470, Find a Grave, http://www.findagrave.com/cgi-bin/fg.cgi?page=gr&GRid=133327470. “British Columbia Death Registrations, 1872-1986; 1992-1993”, database with images, FamilySearch (https://familysearch.org/ark:/61903/1:1:FLYN-ZRM : 30 September 2015), Hector Stanley Butler, 1970.